Just a quickie update this week, mostly to report that the Fussy Fairytales top is finished. I completed the borders today, which was quite the process (I think the "fussy" in the title isn't just referring to the fussy cut blocks!) but well worth the effort. The top is now temporarily residing draped over my kitchen curtain rod, in order to avoid having to re-press everything again if I were to fold it for now. I'm sure you understand! When I was draping it over, I noticed that some of the seams around the border edges are coming loose, I'm sure from handling it quite a bit in the last few steps, so I'll have to repair that before moving on. For now though, since we don't have backing or batting fabric just yet, this project will temporarily be put on hold. Also this week I made a bee block for Bianca, my first regular size granny square block and my first time using Marmalade fabric. Let me tell you, it's lovely! 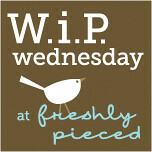 The week ahead ... since Fussy Fairytales is in a holding pattern at the moment, I'll likely get back to the 'Joy' Christmas top, or the 'Sleep' proverbial quilt (both were pictured last week), which are both small-ish and closer to being finished than any of the other projects I have in process. And I happen to have backing fabric for both of them and enough batting to go around. No excuses, right?? Blogger's Quilt Festival continues, Wednesday Oct 31 being the last day to enter and then I presume there will be nominations and voting. Lots of great prizes are up for grabs, so if you haven't entered yet you can still squeak in before the deadline! Or just browse through the entries, there are SO many great quilts! Mine is #143, if you care to check it out. oh I love your new fairytales quilt! What awesome fabric for that pattern! I guess I wasn't paying attention - had no idea what the border was going to be like - but I like it alot!! This looks really great - I love the border especially, but I can see how it must have been a lot or work! It looks just great! The border is perfect! Your Fussy Fairytales is fabulous. And I never get tired of granny squares! Your quilt looks so pretty hanging in the window! Don't let it fade though! LOVE that border - must note it for a future project! How gorgeous! That border may have been time consuming, but its totally worth it!! It's amazing! Your fairy tales quilt is stunning! The curtain rod is an ingenious solution to avoiding creases! Lovely makes! Your granny square is really sweet...one day when I emerge from under the pile of WIPs I already have underway, I'd love to make a Granny Square quilt. Your Fussy Fairytales quilt is so pretty! Beautiful granny square too. I love that block pattern! That quilt is fabulous Heather! And I'm sure it's lovely eye candy hanging from the window. I love your Granny Square too. Marmalade is so much fun! I have a stack that I'm dying to cut into. Oh yeah! This is one gorgeous quilt, Heather! The border is completely fabulous. Great work! Hurray for getting that top done! Seems like you got that done really fast. The fairytale quilt looks fantastic. Even though the border was a pain, it was worth it. Makes the quilt so pretty! Fussy Fairytales is AMAZING! I've never seen a border like that... just WOW. That fussy fairy takes quilt is just perfect! 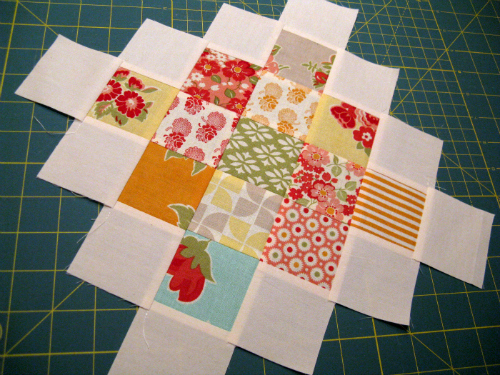 I love this quilt pattern, and your fabric choices are lovely! Very, very nice! Is it your own design? So pretty, Heather! 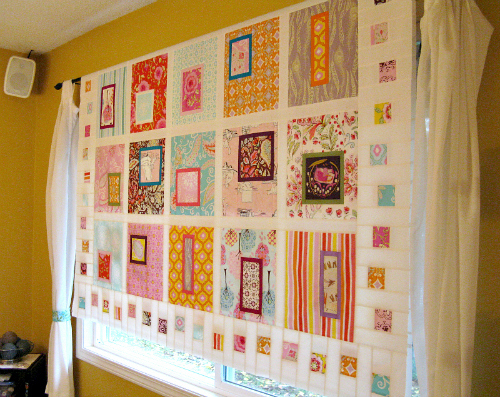 Agree about the borders....they are a pain to make, but totally make the quilt! oh that is SO pretty! Oh, your quilt top is lovely. I can see why the border would take so long, but it looks so great! love your projects. The granny square in marmalade is so cute. I might have to do a whole quilt in that! I really LOVE your Fussy Fairytales quilt. I'm thinking I should scoop up some Nursery Versery and get going on my own. It would be perfect in my daughter's room! This is so cute Heather! I love it. And the granny squares are so fun, she picked great fabric!! The fussy fairytales quilt looks fantastic! I love how all the fabrics you chose work so well together!